Epiphone brings back the Wilshire with a faithful reproduction of the 1966 model. Like an SG guitar, the Wilshire’s double cutaway Mahogany body with a glued-in Mahogany neck that joins the body at the 22nd fret gives you ultimate upper fret access. Lightweight and comfortable, the Wilshire has excellent resonance and natural acoustic tone – even unplugged! Featuring Epiphone’s LockTone tune-o-matic/stopbar combination, the transfer of string vibration is improved even more giving this guitar excellent sustain and clarity. But here’s what separates the Wilshire from the SG. 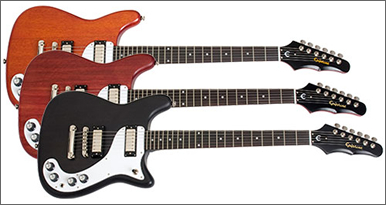 Most early Epiphone guitars including the Wilshire were equipped with mini-humbucking pickups and Epiphone carries on this tradition. With its smaller size, narrow magnetic field and unique design combination, the mini-humbucker produces bright and focused output while retaining famous humbucker “hum-free” performance. A replica of the originals, they feature adjustable pole pieces, enamel wire, bar ceramic magnets and rounded nickel plated covers set in an original style black mounting ring with height adjustment screws. Cool Retro-Looks! Also unique, the Wilshire features Epiphone’s own “batwing” headstock. A classic design that improves tuning ease and accuracy by offering a straight string-pull design, the headstock is adorned like the original with the vintage “Epiphone” logo in gold. Other features include a 1960’s SlimTaper neck profile with Rosewood fingerboard, premium 14:1 die-cast tuners and individual Volume and Tone controls for each pickup. And to give it that worn-in look and feel, Epiphone tops it all off with a thin satin finish. No word on prices that I can find, but the other “worn” guitars aren’t too expensive, so I think these guitars will offer great value and a nice retro/vintage vibe. I’ll be getting one! Well, I bought one of these in “Worn Cherry” a week after they became available and it’s a great guitar. It’s not quite “period correct” as to be so it would need to be fitted with a “maestro vibrola”. However, in all other respects it’s a pretty good reproduction, including period correct mini humbuckers. It’s great to go out on a gig with something that not everybody’s using (yet).